Polyprenols separated from lipids are promising new components from Ginkgo biloba L. leaves (GBL). In this paper, ginkgo lipids were isolated by extraction with petroleum ether, saponification, and molecular distillation. Eight known compounds: isophytol (1), nerolidol (2), linalool (3), β-sitosterol acetate (4), β-sitosterol (5), stigmasterol (6), ergosterol (7), β-sitosterol-3-O-β-D-glucopyranoside (8) and Ginkgo biloba polyprenols (GBP) were separated from GBL by chromatography and identified mainly by NMR. The separated and identified compounds 1, 2 and 3 are reported here for the first time in GBL. The 3D-DAD-HPLC-chromatogram (190–232 nm) of GBP was recorded. 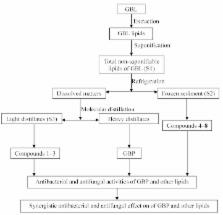 This study provides new evidence as there are no previous reports on antibacterial/antifungal activities and synergistic interactions between GBP and the compounds separated from GBL lipids against Salmonella enterica, Staphylocococus aureus and Aspergillus niger. Nerolidol (2) showed the highest activity among all the tested samples and of all mixture groups tested the GBP with isophytol (1) mixture had the strongest synergistic effect against Salmonella enterica among the three tested strains. A proportion of isophytol and GBP of 38.19%:61.81% (wt/wt) was determined by mixture design as the optimal proportion for the synergistic effect of GBP with isophytol against Salmonella enterica. Antibiotic susceptibility testing by a standardized single disk method. Essential oils (EOs) have been long recognized for their antibacterial, antifungal, antiviral, insecticidal and antioxidant properties. They are widely used in medicine and the food industry for these purposes. The increased interest in alternative natural substances is driving the research community to find new uses and applications of these substances. EOs and their components show promising activities against many food-borne pathogens and spoilage microorganisms when tested in vitro. In food systems, higher concentrations of EOs are needed to exert similar antibacterial effects as those obtained in in vitro assays. The use of combinations of EOs and their isolated components are thus new approaches to increase the efficacy of EOs in foods, taking advantage of their synergistic and additive effects. The purpose of this review is to provide an overview on the antimicrobial efficacy of these combinations. A survey of the methods used for the determination of the interactions and mechanisms involved in the antimicrobial activities of these combinations are also reported. Chemical analysis and quality control of Ginkgo biloba leaves, extracts, and phytopharmaceuticals. The chemical analysis and quality control of Ginkgo leaves, extracts, phytopharmaceuticals and some herbal supplements is comprehensively reviewed. The review is an update of a similar, earlier review in this journal [T.A. van Beek, J. Chromatogr. A 967 (2002) 21-55]. Since 2001 over 3000 papers on Ginkgo biloba have appeared, and about 400 of them pertain to chemical analysis in a broad sense and are cited herein. The more important ones are discussed and, where relevant, compared with the best methods published prior to 2002. In the same period over 2500 patents were filed on Ginkgo and the very few related to analysis are mentioned as well. Important constituents include terpene trilactones, i.e. ginkgolide A, B, C, J and bilobalide, flavonol glycosides, biflavones, proanthocyanidins, alkylphenols, simple phenolic acids, 6-hydroxykynurenic acid, 4-O-methylpyridoxine and polyprenols. In the most common so-called "standardised" Ginkgo extracts and phytopharmaceuticals several of these classes are no longer present. About 130 new papers deal with the analysis of the terpene trilactones. They are mostly extracted with methanol or water or mixtures thereof. Supercritical fluid extraction and pressurised water extraction are also possible. Sample clean-up is mostly by liquid-liquid extraction with ethyl acetate although no sample clean-up at all in combination with LC/MS/MS is gaining in importance. Separation and detection can be routinely carried out by RP-HPLC with ELSD, RI or MS, or by GC/FID or GC/MS after silylation. Hydrolysis followed by LC/MS allows the simultaneous analysis of terpene trilactones and flavonol aglycones. No quantitative procedure for all major flavonol glycosides has yet been published because they are not commercially available. The quantitation of a few available glycosides has been carried out but does not serve a real purpose. After acidic hydrolysis to the aglycones quercetin, kaempferol and isorhamnetin and separation by HPLC, quantitation is straightforward and yields by recalculation an estimation of the original total flavonol glycoside content. A profile of the genuine flavonol glycosides can detect poor storage or adulteration. Although the toxicity of Ginkgo alkylphenols upon oral administration has never been undoubtedly proven, most suppliers limit their content in extracts to 5 ppm and dozens of papers on their analysis were published. One procedure in which a methanolic extract is directly injected on a C8 HPLC column appears superior in terms of sensitivity (<5 ppm), separation, simplicity and validation and will be incorporated in the European Pharmacopoeia. Alternatively GC/MS and ELISA methods can be used. A sharp contrast to the plethora of papers on terpene trilactones, flavonol glycosides, and ginkgolic acids forms the low number of papers on biflavones, proanthocyanidins, simple phenolics, simple acids, and other constituents that make up the remaining 70% of Ginkgo standardised extracts. More research in this direction is clearly needed. For the analysis of Ginkgo proanthocyanidins (7%) for instance, no reliable assays are yet existing. Finally the growing literature on pharmacokinetic and fingerprinting studies of Ginkgo is briefly summarised. [* ] Author to whom correspondence should be addressed; E-Mail: wangczlhs@ 123456sina.com ; Tel./Fax: +86-025-8548-2471. Copyright statement: © 2013 by the authors; licensee MDPI, Basel, Switzerland. This article is an open-access article distributed under the terms and conditions of the Creative Commons Attribution license ( http://creativecommons.org/licenses/by/3.0/). Quantitative analysis of bilobalide and ginkgolides from Ginkgo biloba leaves and Ginkgo products using (1)H-NMR. [Plant biotechnology: an avant-garde research for an ancestral tree, the Ginkgo biloba].